Analysis of India's approach towards it's national security reveals an unacceptable hiatus between the Political -Civil- Military systems. We perhaps were lucky enough to get away thus far even despite the 1962 China debacle. New security realities, an assertive China, a highly probable Sino-Pak collusion, the emergence of non state actors, possible implosion in Pakistan, the Af-Pak mess all call for India to review and revamp its management of national security. Our bureaucracy has the sagacity, expertise and eclectic experience to optimise civil control mechanisms under political guidance. Our military and security forces have the commitment and wisdom to perpetuate democracy and secularism. Ours is a democracy wherein civil control of the military is absolute. We have mechanisms in place to optimally approach “national security and military readiness". This of course has to be politically understood, accepted, absorbed and be top down with sense of ownership, accountability and authority. This paper looks at the quantum and quality of civil- military participation, the higher defence decision making, the structures within the military and the way ahead. Indian political -civil- military relationship needs to be seen in the context of the critical dichotomy between "Authority and Responsibility" resulting in the absence of ownership for military and security. The whole discussion often misses the forest for the trees. In the fog of this debate, the political leadership virtually goes unnoticed and hence never answers for this grave omission. Should our political leadership not take onus of ownership or at least assign responsibility for military and security readiness to an accountable entity. Six decades post independence has not seen any effective viable change. Civil and military martnership needs to be seen in wider contours of nation’s Management, national security, foreign policy, technology self reliance, budgeting: in the frame work of sovereignty, sustainability and survivability as a nation state. It should also include internal security concerns. Intelligence and policing are inherent in this. Who is Responsible for Readiness? ‘Defence of India and every part thereof including preparation for defence and all such acts as may be conducive in times of war to its prosecution and after its termination to effective demobilisation’. The above extract does not mention "preparedness or readiness" even in passing not to speak about the much needed deliberation. It is silent on "Accountability and Answerability"
Security, Sovereignty, Stability of a Nation is clearly a leadership mandate- how it chooses to exercise and execute this, is, its prerogative. Why it remains passive has not been questioned either by the establishment or by the people. The Army, Navy, Air Force are engaged individually in terms of turf protection. There is neither integration nor coordination between the Ministries of Defence, Home, Finance, External affairs with the army, paramilitary and intelligence forces, even as a concept, let alone in practice. Guarding the turf is a solemn obsession. What started as a practice became a habit and is now an addiction. The divide on the concept and role of the Chief of Defense Staff within the three services is sharp enough for the polity to justify its passivity. The IDS Headquarters under the CISC- Chief of Integrated Staff committee is gamely trying to pull the services together and over the last 7 years or so has been proved to be useful. This vindicates the need for a CDS. However, the Naresh Chandra Task Force has recently recommended a permanent Chairman, Joint Chiefs of Staff which is a climb down from the CDS. It is also not very clear as to what powers would CJCS have to enforce/enable integration and jointness. The collateral, attendant impact on the Military and Security scenario is dependent upon the quality, quantity of ownership by the Political- Civil- Military combine in Higher Defense Decision Making. This has direct correlation with India's security calculus, effective military preparation, and readiness. Internal security strategies too, are contingent on the construct of Civilian - Military- Security equations and equity. Our bad neighbourhood is slipping into a vortex of visceral anarchy beyond reason and control. In the North East, China makes us nervous by its rapid and robust build up. Sino- Pak collusion is on the cards. Both may decide to make a play together, to stir the already simmering South Asian Security pot. The Afghan-Pakistan region is also fraught with various probabilities of dysfunctional anarchy. A Taliban take over is most likely, no sooner than the withdrawal of the American led NATO military. The fall out has serious implications in the region. Civil and Military participation in synergy must come into play sooner than later. Examination of our Higher Defense Decision Making Organisation, readily reveals a witting "Six decade status quo syndrome" perpetuated by the way we are as Indians; fatalistic about our Indian-ness and independence. The implications of this on our sovereignty, security, stability, status as a secular Democracy can be understood, absorbed and be acted upon only if the top leadership grasps this with firmness and dynamism. The above schematic is the writer’s imagination. In practice the circles exist but are mostly in separate orbit. At best there are some committees of secretaries and the CCS who deliberate upon important issues on a need based continuum. The military may or may not be called in all deliberations. The origin lies squarely in the Nehruvian mind set at the time of Independence. The Political leadership felt uncomfortable with the British model of command and control. The Bureaucracy too perceived that its primacy was sacrosanct in a democracy. Hence in the euphoria of independence, the Commander in Chief of the military was sectioned into the three chiefs of the three services. The promise of concurrent reorganisation of the Ministry of Defence is yet to be realised. The naiveté of the British cloned, Army dominated Indian military leadership was perhaps an unwitting factor. Ensconced in the cantonment and surrounded by the splendour of fife and drum beat, it did not understand the obvious, apparent difference between being "apolitical and politically obtuse"
The senior Indian Army hierarchy understandably behaved more like proper soldiers than statesmen. They believed in their leadership to do the right thing. What the former laid down then, continues even today. It's approach to civil relations is always confined to a very narrow swathe of the defence ministry. Personnel of the armed forces are conditioned to be indifferent and sometimes with apathy towards the political class. Somehow, that they are people and citizens too, and not a class apart is overlooked in their education. In turn, the polity is comfortable with managing military affairs through the proxy of bureaucracy. Who should educate who, and on what, of the mutual, political & military education remains ignored. Our leadership and bureaucracy adopted the whole works of the erstwhile English Raj through the aegis of the civil services without any consultation with the military. Both believed that the British model was suitable with minor modifications, excepting the military aspect. The euphoria of independence, the challenges of ruling a geo politically united India, infatuation with an English way of life, and dealing with the real politick of governance ensured that the rules of business on national management precepts were not properly thought through. Great Britain left behind a robust system that made lot of sense gave order and form with a strong legal base. Yet it was designed to take away wealth from us and hence in principle not compatible to our culture, tradition and age old valid systems. This has been adequately proved time and again in the way the land has been sub optimally governed. The system is "INDIA" dyslexic, people unfriendly and not result oriented. Government profligacy and inefficiency are in tandem in the maze of complicated red tape. Lack of political direction and a loose limbed hands off approach, queers the pitch of military readiness. Consequently civil military bureaucratic relations exist under best conditions of polite detached, " Us versus Them” and diffused accountability. The first warning that all was not well in this arrangement, was during the ill fated 1962 Sino-India conflict. Despite the lasting trauma of that battle, The Indian establishment continues in the same ilk. Despite all the conflicts with Pakistan and the imposing Chinese posture , the whole Political- Bureaucratic-Diplomatic- Military- Intelligence- Technology-Industrial community has not been able to get its act together! Working in watertight silos is both style and form today. The quality and value of our Civil- Military bureaucratic relationship reflects; our inability to internalise India in terms of national perspectives. Consequently our externalisation tends to be tentative and confusing to us and outsiders. Drifting along with events as they occur seems to be our preferred option"
Both the Civilian Decision maker and the Military executor of the Country are committed to Sovereignty, Security, of a Democratic India. Hence there is neither a threatening crisis, nor even an impasse in the Civil- Military construct. This is the good news. The bad news however is: it is muddled, disjointed, indecisive, frustrating, and cost prohibitive, by default and design. Trust deficit and misperceptions militate against working together. The absence of mandated directives from the political leadership is the root cause of this avoidable morass. The Pen and the Sword can and have to join forces to ensure that files create capable combat effectiveness. Both bureaucracies are pseudo go betweens with each other. All dialogue is on a dated filing system with a conundrum of file processing. In the Services, the file follows a hierarchical path from downwards to upwards and reaches Ministry of Defence at the level of Defence Secretary/ Additional Secretary. From that level it plunges straight down to the desk officer and is processed upwards through every layer. Unless this is changed inordinate delays in decision making would continue. In effect the silent strangler of the system is the file. India, compelled to adopt the White Hall filing system as part of its legacy of freedom, continues with this archaic practice of file based decisions. The Civil and Military bureaucracy grew with this paper trail. Today despite the obvious advantages of the information highway, presence of useful decision supporting Management Information Systems; files still do the rounds at snail's pace. In practice, the whole process precludes collegiate decision making. The underlying working principle is to ensure that the file notes do not ever implicate any decision makers or subordinates on both sides. File Noting hence is defensive, tentative and tend to be open ended. It is no exaggeration to state that diffused accountability through obfuscation is the norm; fear of CVC/CAG (Central Vigilance Commission and Comptroller Auditor General) too is another catalyst for playing safe. This file process is the silent strangler, impervious to other dynamic changes brought in force through revised procurement policies. File work must be minimal and supported by IT based decision processes. Information archiving, retrieval is the need of the day. Collegiate decision making is the answer in a networked set up. Secure LAN/WAN arrangements and software processes must become policy sooner than later. Direct, institutionalised, formalised communication between National Leadership, Parliament and the executors of the country's Defence and Security policies and processes is more in absentia. The Parliamentary Standing Committee on DefenCe is notional, ineffective and powerless by design and organisation. Even in this, the armed forces only tag along with their civilian counterparts. The time, attention and energy devoted to the whole exercise is adhoc, cursory and a mere formality. Similarly the MOH and MOD have no mandated Rules of Business on Internal security supervision. One important facet of bureaucratic relationships is the complete impersonal imprint and a mindset to only dialogue on file and keep records. Time delay is a given, devoid of any emotional involvement. Preparing for an exam while hoping that it never takes place Maintaining a Combat ready entity in a 95% plus peace time continuum? This calls for an "Us with Us" approach. Dealing with Internal security Issues on the concept of an " an iron fist in a velvet glove"
Managing; the promotion pyramid, the career construct, the significant superseded strata and rising expectations of a better educated, evolving military society! Handling technology obsolescence in the face of ever present imminent combat and security threats in incipient conditions of uncertainty. Living with bereavement and dealing with rehabilitation of families and the large number of retirees. Learning to meld and blend combat culture with corporate practices to optimally organise the entire establishment needs, through serious, deliberate planning, money, in terms of intention, effort and determination. Funding determination as part of the military budget for resettling families and transitioning veterans into civilian careers. Can India live on its ancient glory, and its recent success of sorts? Is there room for complacency in a rapidly changing and deteriorating security scenario in the neighbourhood. Radical Islam, rapidity of information spread, increasing awareness on rights, rising expectations, inequitable economic weaknesses, poverty spread, malnutrition; all cause social unrest and desperation. Who is responsible, accountable for combat and security readiness? Is the present civil -military arrangement able and workable across the span of governance, administration, nation’s management, diplomacy, defence, security and poverty alleviation? Does India have overall national capability to handle both the neighbourhood as well as internal security issues and complexities? Does defence budgeting require a different dynamism to make military management and acquisition cost effective? What are fault lines within the Military that need speedy remediation? Why has India not set up a defence Industrial base to strategically reduce Import costs? The military will always fight with what it has- (COAS, Gen VP Malik during OP Vijay in Kargill) . Lack of " Ownership of Readiness" is behind this soldierly lament. Fixing Ownership of Readiness is the first step. It should be the Defence Minister who should be made answerable for military readiness and sovereign security. Similarly the Home Minister should be responsible for Internal security. Once ownership is defined with authority, the whole chain would be galvanised into a channelised process of achieving stated objectives. Process and authority in capability based capital acquisition is paramount. It has to rest and vest on a single point authority along with an empowered Organism. A pre audited collegiate decision matrix with autonomy and assurance that "Ghosts of Inquiry" do not unwittingly haunt the decision makers. Only then can the system become Nationally able and capable to handle Combat and Security management. Concept of unified operations is an operational imperative. Training and learning to fight together should become part of our blood stream. This can and must be done with retention of individual service identity. From unified operations will stem Joint Operations and Individual service missions. This will strengthen our combat capability in synergy. Creation of a Chief of Defence Staff with attendant revision of roles in Chiefs of Staff has to be through an act of Parliament. Creation of theatre commands must be also mandated. Cost benefits and operational effectiveness study of the American example shows significant salutary effects on combined combat readiness. Personnel management, selection of Commanders in Chief and Heads of Services must be done on an informed, participative basis that includes the politico- bureaucratic setup. Serving Military- Bureaucratic- Diplomatic, Intelligence, senior leadership from joint secretary upwards must attend regular participative workshops of short durations. 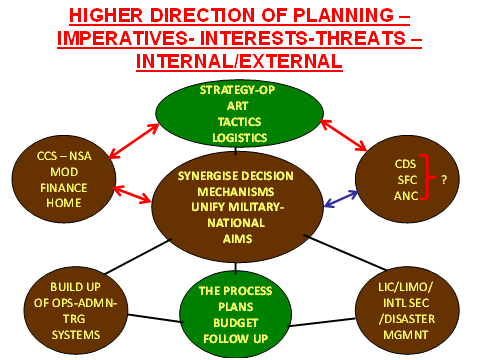 It hasto be formalised, structured on the determinants of national management and consequent military matrices. The CCS Ministers and National Defence Council members must address these gatherings and gain critical inputs. It must become a regular feature that would bring synergy in civil- military participation. Appointing Joint/Additional Secretaries from MEA/MHA to all critical commands that contend with sensitive issues must become policy. Similarly having service officers and MOD representatives in MEA/MHA must be mandated. Creation of a common information highway should be taken up as the first dynamic. Informed collegiate decision processes must follow suit. We are no where near becoming “Indian” in terms of becoming reasonably self reliant across the spectrum of Indian battle order needs. Civilian and military participation has to enable creation of a Military Industrial Commission. This could be set up from existing entities like CII, FICCI, DRDO, DPSUs, Armed forces, Private and Public sector companies. Oversight could be by the Defence Acquisition Council. The Military Industrial Commission charter could be created from the findings and recommendations of the various committees set up by the Government within the last two decades. The Political-Civil-Military combine also needs to institutionally focus on the critical aspect of self reliance and reduce rising import costs. Higher Defence and Security Decision Making Robustness can be achieved by the Cabinet Committee on Security (CCS). It must mandate institutionalised mechanisms between the National Security Advisor (NSA), the Ministries of Defence, Home, External affairs. Civil control of the military is a given. Integrated, inclusiveness of the armed forces through proactive participation will optimise combat and security preparedness. Creation of a Chief of Defence Staff and defining Unified Commands like SFC, ANC should be carried out immediately by legislation. Unified Areas of operations, defining, national interests, military & security threats, have to be on priority in the reporting and preparation mechanisms. The Standing Parliamentary Committee on Defence needs to be elevated to A National Defense Council (NDC). It should have leaders of the ruling and opposition. It must be empowered and organised to monitor military readiness formally, in camera. Joint review by CCS to validate this must be mandated. The CDS/the Chiefs of Services must annually report the state of military readiness to NDC regularly. Civil control over the military in a democracy is a sanctified given in India. Ownership of military, its preparedness, readiness are integral, inherent and sacrosanct to national Interests. They are intrinsic in nation’s management. Our 5000 years DNA in many ways is a genetic gift of being flexible and yet forged to withstand tsunamis, and tectonic shifts of global geo- political movement and collateral combat, and security situations. India is poised at the tipping point on the international ledge of global geo politics- It can be a model to the world as a successful stable democracy. The centre of gravity is the silos of the political-civil and military becoming a sacred granary of security in synergy for our lasting sovereignty. Optimal civil and military participation will make India reach its ordained destiny.